H.P. 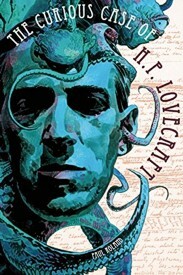 LOVECRAFT is widely regarded as one of the greatest writers of modern horror fiction and a pervasive influence on popular culture. His monstrous creations – the mighty Cthulhu amongst them – have shaped the look of countless films and featured in every form of fantasy art, from graphic novels to computer games. Continually ensnaring fresh devotees, his fiction is an inspiration to authors and filmmakers as diverse as Stephen King, Guillermo Del Toro and Neil Gaiman. Yet this eccentric and reclusive resident of Providence, Rhode Island, did not have a book published by a major commercial house during his lifetime. He died in comparative obscurity aged just 46, convinced that he had failed to achieve the recognition he deserved. Riddled with self-doubt, disappointment and despair, Lovecraft’s demons were by no means confined to the page. In this accessible new biography, author Paul Roland pieces together the evidence – drawing upon Lovecraft’s correspondence, the forgotten memoirs of his estranged wife Sonia (unearthed from the archives of the Providence Journal) and the history of The Necronomicon – to discover the man behind the myth. Illustrated with personal sketches, letters and manuscripts in Lovecraft’s own hand as well as rare family photos from every phase of the author’s life. The Curious Case of H.P. Lovecraft. By Paul Roland. London, UK: Plexus Publishing; 2014; ISBN 978-0-85965-517-0; paperback; 240 pages. This book may be purchased in paperback from Amazon.com or Barnes & Noble or directly from the publisher, Plexus Publishing.